"As a child I had no mother's arms to hold me. No father to lead me into the world. Us taken- away kids only had each other. All of us damaged and too young to know what to do. We had strangers standing over us. Some were nice and did the best they could. But many were just cruel nasty types. We were flogged often. We learnt to shut up and keep our eyes to the ground, for fear of being singled out and punished. We lived in dread of being sent away again where we could be even worse off. Many of us grew up hard and tough. Others were explosive and angry. A lot grew up just struggling to cope at all. They found their peace in other institutions or alcohol. Most of us learnt how to occupy a small space and avoid anything that looked like trouble. We had few ideas about relationships. No one showed us how to be lovers or parents. How to feel safe loving someone when that risked them being taken away and leaving us alone again. Everyone and everything we loved was taken away from us kids." 2017 is the 20th Anniversary of Bringing Them Home. Read a Commission article about why the findings are still significant twenty years on. 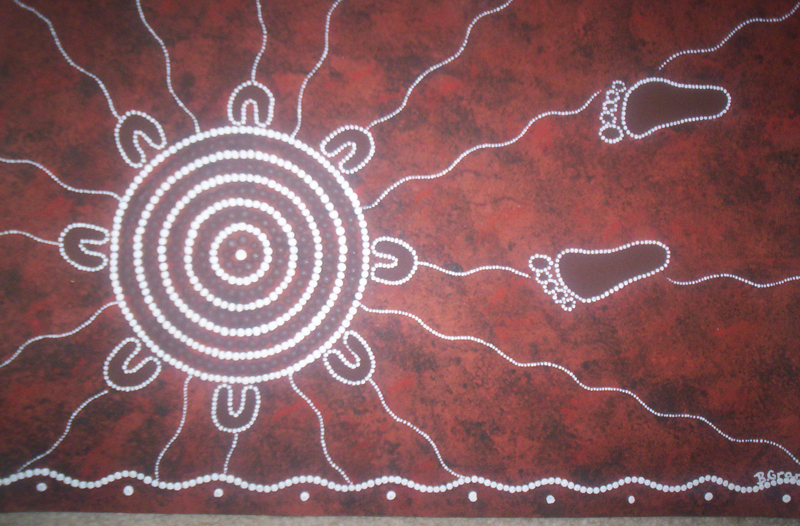 Please be aware that this publication contains the names and images of Aboriginal and Torres Strait Islander people who may now be deceased. 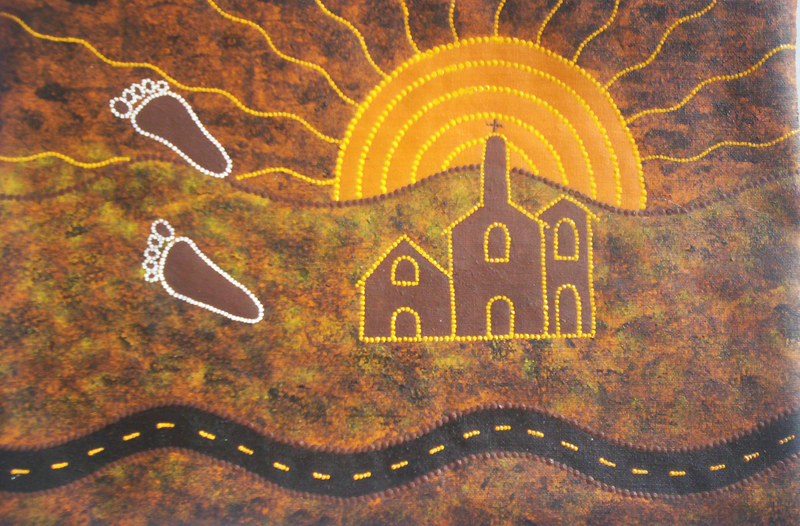 Story: Leaving the missionaries and the Mission, to find family and to commence nursing in mainstream in 1967- the year of the referendum for Aboriginal recognition and citizenship. 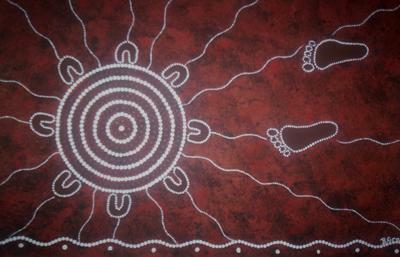 Footprints signify return to family, people and homeland. Story: The family sitting around our circle, participating in a smoking ceremony down by the Lachlan River, NSW. 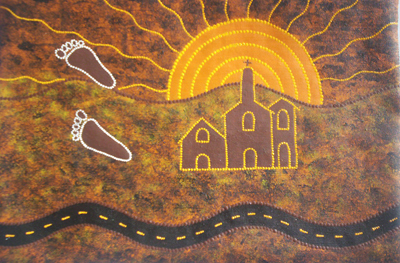 Footprints signify return to family, people and homeland. 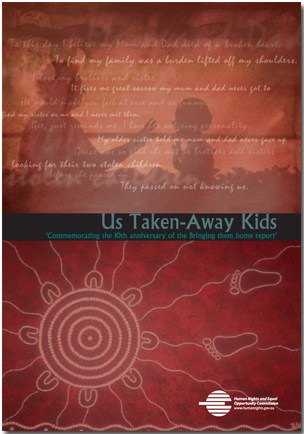 * 'Us taken-away kids', quotation taken from Alec Kruger and Gerard Waterford, Alone on the soaks, IAD Press, 2007. All quotes reproduced with permission from the authors.